How to choose a powerful electric pressure washer? Who makes the most powerful pressure washers? A Electric Pressure Washer is a convenient household tool. It can be used to clean home yard, cars, and furniture. However, there are so many models available on the market, in which each has its own disadvantages and advantages. 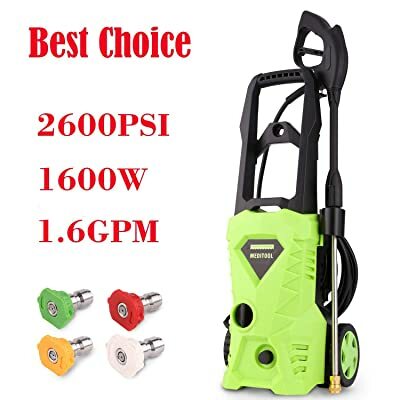 We have experienced and researched a lot of models to pick the 5 strong electric pressure washers with lovable prices. Meditool 3000 PSI Electric Pressure Washer has the power, the convenience, and also the versatility. The rated power pressure and the max pressure of the washer are at the top of the home-use electric washer industry – 2200 and 3000 PSI. The washer surely can clean all types of Dirt, Grime, Gunk, Oil, Rust, Mildew for all kinds of surfaces – Vehicles, Cars, Yards, Homes, Driveways, Decks. It is featured with 5 Nozzles – a 0 degree for the most difficult clean areas, a 15 degree for concrete/brick/hard surfaces with stubborn, a 25 degree for painted/wood/siding fences, a 40 degree for windows/screen washing, and a 60 for liquid soap. You can choose the most suitable flow to wash various surfaces and tasks. The Total Stop System (TTS) helps automatically stop the pump when the trigger is not engaged to save energy, prolong pump life, and avoid unexpected accidents. The upright design with axle mounted wheels allows easy roll-away mobility. A 33 ft power cord with inline GFCI is for use on all exterior outlets. A 20 ft high pressure hose, a spray gun, and a stainless steel wand are provided for greater reach. Mobility is the advantage of an electric pressure washer over a gas pressure washer. And Tagorine Electric Pressure Washer, for me, is the most compact and mobile electric pressure washer but still powerful. 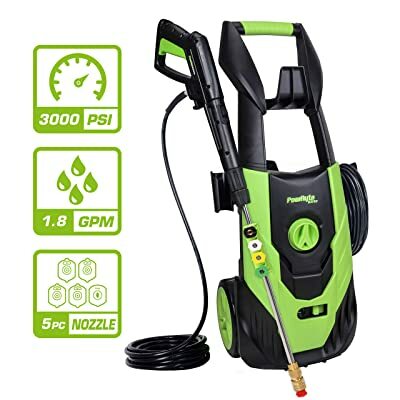 Tagorine Electric Pressure Washer is like the smaller version of the Meditool Washer, in which they sacrificed a bit the power and the sturdiness for the convenience and the mobility. The overall design and accessories are quite the same. However, Tagorine Washer just has 2000 PSI rated pressure, 2600 PSI max pressure, and 4 Quick-Connect spray tips – 0, 15, 25, 40 degrees. Instead, the Tagorine is smaller, lighter, and can be used vertically or horizontally. 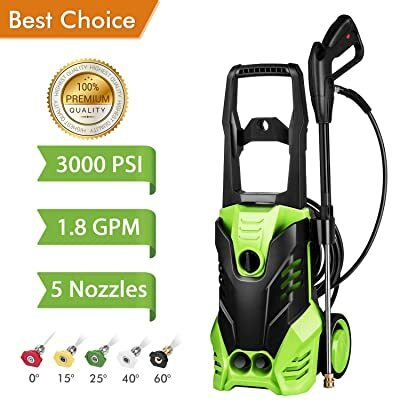 Tagorine Electric Pressure Washer is more convenient than the Meditool 3000 PSI Electric Pressure Washer for normal household use. However, if you intend to use it for heavy duty cleaning tasks or want to reach a farther distance, the Meditool 3000 is better. PowRyte Elite Electric Pressure Washer is really a versatile machine. It has an all-in-one nozzle. The nozzle can be twisted to spray seamlessly from 0 to 40 degrees and can be adjusted to generate high to low pressure for different tasks. You can use an included turbo nozzle to produce a 0-degree rotating spray that can remove dirt 1.5 times better than normal sprays. The washer has a powerful pressure of 3000 PSI, a high flow rate of 1.8 GPM, the TTS technology, a 20-foot high-pressure hose for more convenient. There is also an onboard tank for cleaning tasks that need detergent. Only one thing that might make you feel inconvenient is that the hose is a bit difficult to connect to the washer’s case. PowRyte Elite Electric Pressure Washer with the smart nozzle design is really effective for removing stubborn stains. 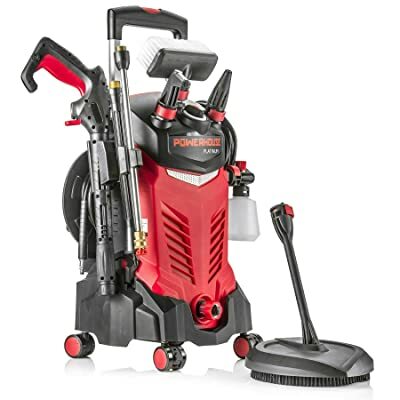 A lot of accessories comes with Powerhouse International Electric Pressure Washer to make full use of the 3000 PSI and 2.2 GPM power. The washer has a flexible hose, which is 30% more flexibility than normal models, for easy adjustment in small places. A spray gun with 2 stainless steel lances is used for various purposes. One lance is proprietary to attach exclusive nozzles: a turbo and angle nozzle, a patio nozzle for surface cleaner, a soap foam sprayer. One lance is universal that will fit most other attachments (5 Quick Connect spray tips – 0, 15, 25, 40 degree tips and a watering tip are included). Besides having so many features, Powerhouse International Electric Pressure Washer has a high-quality design. The rock-solid case and premium will last for years. They rest on a detachable cart with 4 casters that can be locked into place or allowed to roll freely to follow you when you are cleaning. And the telescoping handle provides you with easy maneuverability. Highlight features Universal spray gun, 5 Quick Connect spray tips, Turbo and angle nozzles, Patio, Soap foam sprayer, Brush. Powerhouse International Electric Pressure Washer is the premium electric pressure washer for luxury places. The Pressure Washer Manufacturers’ Association (PWMA) is a non-profit trade association of manufacturers of pressure washers. PWMA standards ensure that its washers meet the safety conditions and will perform well for a long time. 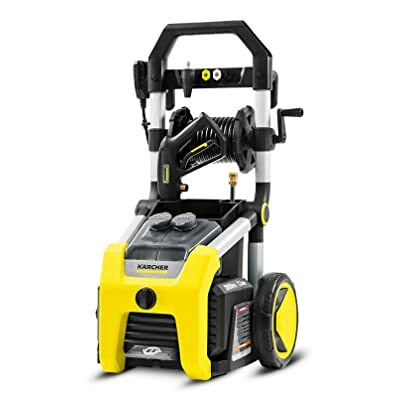 Karcher K2000 Electric Pressure Washer is the best PWMA Certified Electric Pressure Washer. It is easy to use and reliable. The washer has dual removable detergent tanks with selector switch and integrated water filter. The handle can be folded for convenient storage. 4 quick connect nozzles: turbo, 15 degrees, 40 degrees, and detergent. And it comes with a 3-year warranty program. However, Karcher K2000 Electric Pressure Washer isn’t equipped with the TTS technology like 4 washers above, but just a convenient on/off foot switch. Another big drawback of the washer is that the max pressure and the max flow rate is quite low – 2000 PSI and 1.3 GPM respectively. Highlight features PWMA certified, 4 quick connect nozzles, Convenient on/off foot switch. If you want a reliable washer, Karcher K2000 Electric Pressure Washer is the choice for you. Versatile nozzles and accessories: For multi-purpose use from light, medium to heavy-duty cleaning tasks. Long and flexible Power Cord and High-Pressure Hose: For better reach and convenience. TTS technology or an on/off foot switch: To save energy, prolong the machine lifetime, and to avoid accidents. Suitable Voltage: In the US, it’s 120V/60Hz. But in EU and Asia, it’s 220v/50hz. I’ve reviewed these features and some of the best powerful electric pressure washers above. PowRyte is an American manufacturer of pneumatic tools and accessories. Being founded in 1998, now they have become one of the leading brands in the industry. Their products are sold across the world, especially in Europe, Australia, South America, and the United States. Over 20 years of operation, PowRyte has built the infrastructure to support the daily requirements to supply a full category of pneumatic products. They produce from Air Tools & Compressors, Tire Inflaters, to Pressure Washers and Heat Guns. Powerhouse International is a family-owned business in Lincoln, Nebraska. They only make electric pressure washers and they do it great. Their washers are all premium that has not only high quality but also top technology features. Powerhouse International is the trusted brand that has the best electric pressure washers. Kärcher is the world’s leading provider of cleaning technology. With high-pressure washers, vacuum cleaners, steam cleaning machines, steam vacuum cleaners, household pumps, sweepers, water purifiers, and so on, Kärcher provides satisfactory solutions for all cleaning problems, including equipment and accessories. They also have excellent consulting and after-sales service. In 2017, Alfred Kärcher GmbH & Co. Group KG has 12,300 employees working in 67 countries with 110 companies, and a repair service network of 50,000 points worldwide. They are famous for their technology innovation as they invest vastly for research and development, the most advanced production methods, intensive and advanced training for employees. As part of a project to clean up cultural structures, Kärcher has been involved in cleaning up 140 monuments around the world since 1980. This project includes such outstanding works as St. Peter’s Square. Peter in Rome, Italy, the Brandenburg project in Berlin, Germany, the statue of God in Rio de Janeiro, etc. Kärcher is surely one of the biggest names in the cleaning industry. A typical gas washer would put out 2,000 to 2,800 psi of pressure and a typical electric washer would put out 1,3000 to 1,700 psi pressure. This level of pressure is enough to clean vehicles, homes, decks, but might take a lot of time for cleaning a grimy concrete patio. You can look for a 3,000 PSI washer for this kind of task. However, the more powerful, the more risk. You need to be careful to avoid splintering and etching wooden tables and other soft surfaces. A higher power also means a higher noise. Using a high-pressure washer for a long time might cause harms to your ears. In this case, ear protection accessories are recommended. A typical electric pressure washer would put out less pressurized spray than a gas pressure washer. The pressure is about 1,300 to 1,700 psi, which is not powerful enough to clean concrete. However, there are also a lot of overpowering models of electric washers that can generate up to 3,000 PSI pressure. Those models are far from enough to clean hard concrete. You can look for the most powerful electric pressure washers in my review above. How many PSI do I need to clean bricks? A washer with above 2,000 PSI and 1.3 GPM is sufficient for normal brick cleaning. However, for cleaning stubborn stains and hard bricks, you may need a 3,000 PSI and 2.2 GPM washer. A good pressure washer would let you control the power of spray. In order not to scratch the paint of your car, you need to limit the spray to 2000 PSI and 1.6 GPM. Are electric pressure washers as good as gas? For me, electric pressure washers are better than gas pressure washers. Because, they are quiet, lightweight and portable. Electric pressure washers also don’t require to be maintained much and you won’t need to purchase gas or oil. However, one thing that a gas pressure washer excels at is the lifetime. A gas pressure washer can last for more than 10 years, while a typical electric pressure washer just lasts for about 4 or 5 years. How long do electric pressure washers last? A typical electric pressure washer just lasts for about 4 or 5 years. Above are my full review of the most powerful electric pressure washers. Hope that the information in this article will help you find the suitable washer for you.